Unfortunately the virus somehow made it on the the only ship that could save humanity. You thought you were seeking‍‍‍ safety and comfort by finally reaching the USS Salem. That couldn't be further from the truth. Below is our ‍‍‍amazing team of Paranormal Experts and mediums! The Commissary Food stop- We have different carnival food options in our pre show area that will help you fill any hunger you have. Merch Shack- visit our cool Merch Shack to get some Ghost Ship Harbor swag! 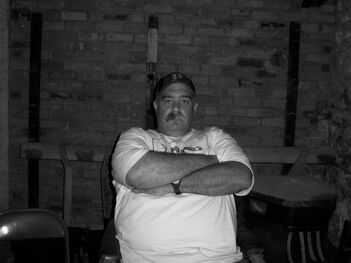 Don is a paranormal investigator with many years of exper‍‍‍ience, and an intimate knowledge of USS Salem. He and the organization he founded, the Greater Boston Paranormal Associates, have been featured in numerous publications and have worked with some of the most well respected names in the field at some of the most sought after locations. The GBPA has conversed with Nathaniel Hawthorne at the Old Manse in Concord, MA and photographed the nation’s first female serial killer at the Charleston (SC) City Jail. Don was among the first to investigate the Salem, and between the naval and paranormal history of the ship is an unparalleled source of Salem’s dark past. Paranormal Ghost Ship- is an experience that encompasses many aspects of Paranormal. It is lead by some of the best paranormal experts in the business (see bios below). From the tools used to the first hand stories of paranormal acti‍‍‍vity on the ship, you will learn and possibly get to see for yourself how haunting the USS Salem can be. The Paranormal VIP Experience is a 45 minute experience where you will dive into the history of the paranormal beginnings of the USS Salem. After you will be able to go into rooms on the ship to try and contact ghosts through hi tech paranormal equipment. 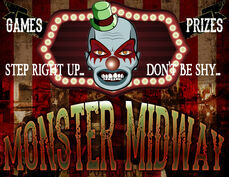 *Visit our monster midway to play some games! New in 201‍‍‍7 we took you through all things phobia! You will enter the dreams of a little girl named Isabelle who has been having nightmares of epic proportions. Fear no Evil will test any and all phobias while you jump from dream to dream containing clowns, spiders, claustrophobia and many more evil things. New Phobias will be added in 2018! New and improved for 2018 we will be testing your fear of heights in ou‍‍‍r Acrophobia VR Experience and making it even more immersive. There is an additional $5 cost for this experience! WHAT IS GHOST SHIP HARBOR? Ghost Ship Harbor is a totally Immersive Haunted Attraction new to the Boston area in 2016. When arriving at Ghost Ship Harbor you will feel like you are in an alternate universe. We have a pre-show area where you will find our food, entertainment‍, tarot card reading, VR experience and more. Ghost Ship Harbor has 4 attractions, a full bar and all of it takes place on the deck of a 716 foot heavy cruiser (battleship). For 2018 we have revamped all of our attractions so it will look and feel brand new. Kristene Gulla is also known as Kristene Queen of Cups, based out of Stoughton, MA. 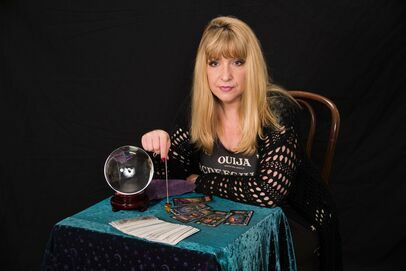 She specializes in‍‍‍ psychic readings including mediumship (connecting with spirit), tarot cards and tea leaves (predicting your future), psychometry (reading your energy), crystal ball (filled with surprises!). She also has a passion for life-coaching (empowerment and boundary function). She is available upon request to entertain your party or to read you privately over the phone. This will be her third season aboard the USS Salem's Ghost Ship Harbor attraction on the VIP Paranormal tour. She delivers messages to groups and individual guests on the tour in the Seance Room. You can find her on Facebook at Kristene Queen of Cups for upcoming events, charity fundraisers, or to book an appointment. y of the ship is an unparalleled source of Salem’s dark past.